Haines Hunter Offshore boats are made to carry fishermen to their favourite fishing spots without having to worry about rough conditions. 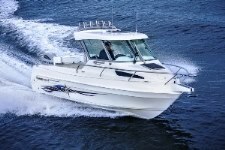 Haines Hunter 675 Offshore hardtop gun fishing boat belonging to angler Jack Auld. The Haines Hunter Offshore series of boats are so named — unsurprisingly — for the fact that they take anglers long distances over the water in relative comfort and safety. 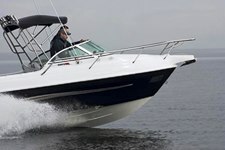 Two favourites which we reviewed are the Haines Hunter 625 Offshore and the Haines Hunter 675 Offshore Hardtop. The 625 Offshore was originally reviewed by one of our Queensland-based fisherman who wasn’t quite so accustomed to southern conditions. At the time, he described the Haines Hunter 625 Offshore as "primarily designed to suit long-distance travel in harsher-than-usual conditions. For that reason, my expectations of the ride were going to be above average, although I had no doubt whatsoever that the Haines hunter 625 Offshore would produce the goods." Matched with a top fishing package, the Haines Hunter 625 Offshore is suitable for both gamefish and bottom fishing, the ride being the standout quality. Our other favourite was a stunning Haines Hunter 675 Offshore Hardtop belonging to Melbourne-based fisherman Jack Auld (see below). This boat supersedes the Haines Hunter 650 Classic and takes much of its design character from the 650 R Ltd and the 650 Enclosed. It has a raised topdeck and shorter cabin, plus that optional hardtop. The setup meant it had a higher centre of gravity but this was found to have minimal effect on the ride which, like the Haines Hunter 625 Offshore we tested, was simply superb. As mentioned, you can see the full review below.